What does Kingdom Hearts creator and Final Fantasy designer Tetsuya Nomura has do in his free time when he’s not directing Final Fantasy XV and Kingdom Hearts III? 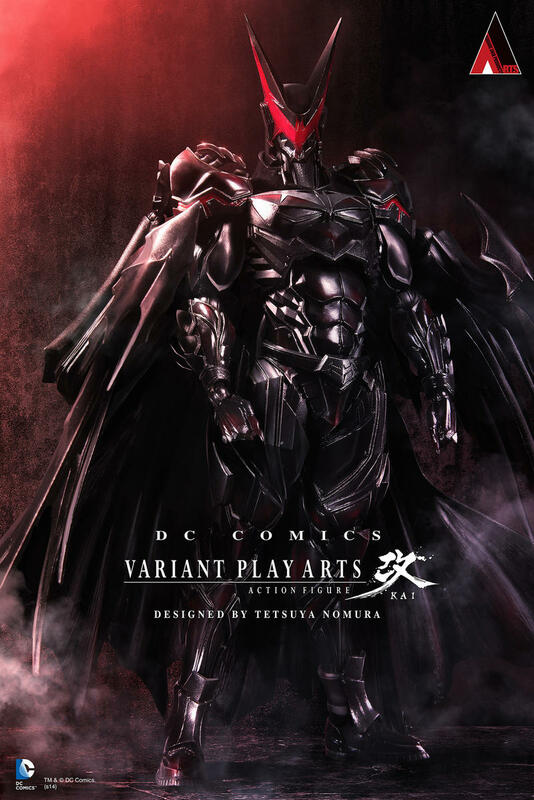 Well, I guess he’s designing Batman figurines for Square Enix’s Play Variant Arts Kai action figure line. It’s not exactly subtle either, is it? For better or for worse, Nomura has been Final Fantasy‘s preeminent artist since he scored big as the character artist for Final Fantasy VII. Infamous for covering his characters with an unspeakable amount of accessories, weapons, and, most importantly, zippers, his art style has clicked more with the young Akihabara crowds than the more classic style used in the older games. 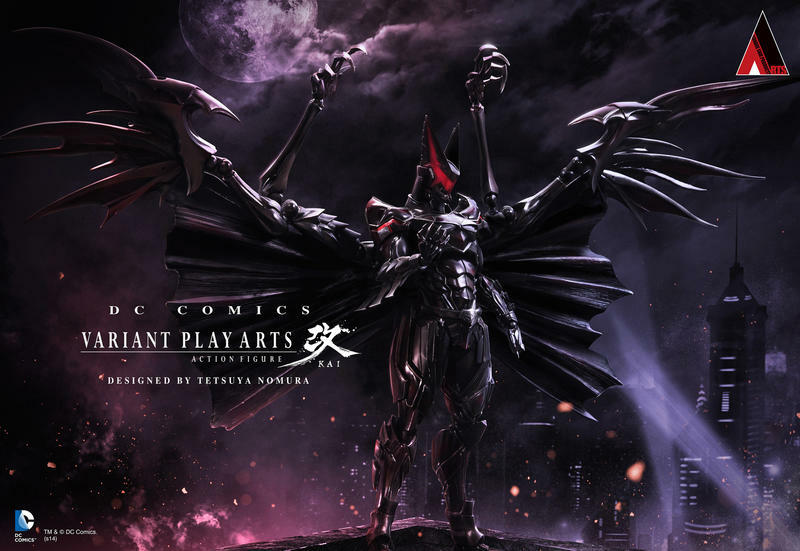 His Batman is just a little too far over the top, especially the claws and extra frills emerging from the tips of his cape, if you can even call it a “cape” any more. That doesn’t exactly scream of the efficiency and effective use of costume that Batman demands. I thought that Batman: Gotham Knight DVD had some pretty ridiculous takes on the dark knight, but this one is just the silliest of them all. Is there a human under there, or is the caped crusader really just as mechanical as he looks? Not that I’m a total hater of Nomura’s. I’ve liked plenty of the games he’s designed. His simple designs in Final Fantasy VII, Parasite Eve, and Brave Fencer Musashi are nice, and his more outlandish art like in Final Fantasy X and The World Ends With You still make sense in the context of their games. When he goes too far, like he does with this Batman, he really goes off into the deep end. Those angsty black robed, zipper loving villains of Kingdom Hearts, a game about Disney and Final Fantasy characters playing along together? Yeah, you know that’s Nomura. You don’t have to dissect the “aging metal band” cast of Final Fantasy XV that much to tell it’s him behind those costumes either. Let’s not forget Lightning and company, either. The version of the action figure now at Comic Con is just a prototype, and Square Enix even hinted at an entire line-up by Nomura, including even more characters. I’m not sure if I should be excited. No date or price has been set on the figures or this particular Batman yet. Any takers?